Size really doesn't matter when hunting the Columbian Whitetail. It's an adventure in and of itself. Americans like big. We live life large, supersize everything and admire larger-than-life figures and accomplishments. That holds true for deer hunters. While we all enjoy meat hunting, few Whitetail Journal readers are not enamored with big bucks sporting big antlers. And just like you, I am fascinated by antlers — especially large antlers. A giant whitetail rack stirs something inside me that’s hard to describe. But size is all relative, isn’t it? Sometimes smaller is really better. Examples? How about debt? Disease? An earthquake. A tsunami? A medical practice? Government? A tiff with your spouse? These, and many other examples you can think of, are certainly better when small. I’ve taken the smaller-is-better mantra to heart in my own whitetail hunting. While I love chasing those mega-brutes of the Midwest, what really fascinates me these days are proportionately large antlers on smaller, indistinct and rare whitetail subspecies that many have never heard of, let alone hunted. For example, I love hunting the Coues whitetail (Odocoileus virginianus cousi) of the southwest, and the even smaller and rarer Carmen Mountain whitetail (Odocoileus virginianus carmensis) located in a small band of mountains in south Texas that extends into Old Mexico. With both, bucks with antlers comprising more than 110 inches of bone are real studs. 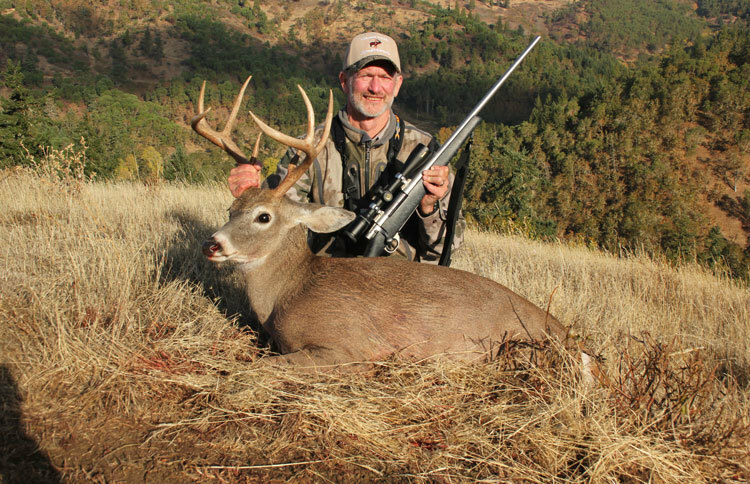 In October 2015, after years of planning, I took the “even when they’re big, they’re small” game a step further, heading to western Oregon to hunt the rare and diminutive Columbian whitetail, Odocoileus virginianus leucurus. Columbian whitetails are not the continent’s smallest deer — the protected Florida Key subspecies (Odocoileus virginianus clavium) holds that distinction — but it is the smallest we can hunt in North America. They are found in two separate populations. The lower Columbian River population is found in Wahkiakum and Cowlitz counties in Washington and Clatsop, Columbia, and Multnomah counties in Oregon. The second population is in Douglas County, Oregon, in the Umpqua River Basin. Early records indicate Columbian whitetails were once quite numerous over its historic range, from the western slopes of the Cascade Mountains to the ocean and from Puget Sound in Washington southward to the Umpqua River Basin in southern Oregon. They became endangered throughout this range due to habitat modification by human activities such as farming, logging and commercial and residential development. Thus, the Columbian whitetail was federally listed as endangered in 1968, at which time the estimated population was thought to be less than 1,000 individuals. A recovery plan was published in 1983. Unfortunately, the lower Columbian River population suffered heavy losses due to extensive flooding of its habitat in 1996; it remains completely protected today, though biologists believe it will be reproductively sustainable in the years to come. However, the Douglas County population has rebounded and was delisted in July 2003; today that population is estimated to be over 5,000 individuals, is self-sustaining and the herd is managed by the Oregon Fish and Wildlife Department. Today the Umpqua River Basin is the only place in the world where this subspecies can be hunted. The team glassing for Columbian whitetails near Roseburg, Oregon. A quality 10X binocular and spotting scope are essentials for this type of hunting. The largest Columbian whitetail in the current online edition of the Safari Club International record book — SCI is the only major record keeper to recognize this deer as a separate subspecies — is a non-typical taken by Corey Hyde in 2007 in Douglas County that scores 133 3/8 SCI points. The world record typical was taken by Timothy Salisbury near Roseburg, Oregon, in 2010; it scores 130 1/8 SCI points. To date, only 18 typical and five non-typical bucks entered into the SCI record book score over 100 points. The minimum requirements to gain entry into the SCI book are, firearm: Gold, 98 6/8; Silver, 79 1/8; Bronze, 70; and archery: Gold, 78 1/8; Silver, n/a; Bronze, 45. These deer can be hunted with any weapon, with spot and stalk techniques the most common method employed. This is right up my alley. My good friend Wade Derby of Crosshair Consulting helped arrange my hunt with crackerjack outfitter Taylor Thorp of 4x4 Outfitters. The season opened October 3, 2015, and ran through October 11. After purchasing a nonresident hunting license, I obtained a LOP (Landowner Preference) permit from the Oregon Department of Fish and Wildlife. That allowed me to take either a Columbian whitetail or Columbian blacktail on the ranch where Taylor outfits. It also happens to be the same property where the majority of the large SCI record book bucks have come from. “Even though there is a state tag draw for Columbian whitetail tags, essentially all the good hunting is located on private land,” said Derby, who has been booking these hunts since shortly after the first season opened.”Those who want to hunt them need to have a place to hunt lined up beforehand or risk big disappointment.” To date, less than 100 tags have been issued each year. And so, in the pre-dawn chill of opening morning, October 3, Thorp maneuvered us quietly into position on the ranch, located just outside Roseburg, Oregon. “I’ve been watching these bucks for a week now, and they always seem to be along the base of those trees at first light,” he had told us earlier. Derby and his 14-year-old son Cody, were with us. Wade and I have been friends for decades, and I have been able to watch Cody grow up in hunting camps around the country. It was a comfortable and skilled team. As the false dawn began to illuminate the eastern horizon Thorp tensed. We slipped in closer, I took a solid rest, and not five minutes into the season had crosshairs on the largest buck. At 250 yards, the shot was almost a gimme, and just like that, a hunt I had dreamed about for nearly a decade — almost as long as the Columbian whitetail has been huntable — was over, and I had a beautiful, typical, 8-point buck on the ground. Later we taped his antlers at 102 3/8 Safari Club International points. Thorp outfits on the ranch that has produced the majority of the Columbian whitetail bucks in the record book. In fact, Douglas County, Oregon, is currently the only place where these deer can be legally hunted. Thorp grew up in the area, has known the rancher all his life and knows the ground he hunts like the back of his hand. Hunters are required to possess a valid Oregon hunting license and deer tag, and obtain an LOP (Land Owner Preference) voucher to be able to hunt here. This combination makes it possible to harvest either a Columbian whitetail or Columbian blacktail buck — and the area is loaded with blacktail. Blacktail deer can also be hunted on the ranch with just a state deer tag. After picture taking, field dressing and hanging my buck, we were off once again. Derby — who has already taken numerous Columbian whitetails — was looking for a dandy, while Cody had a state deer tag valid for a blacktail. He was looking to take a management buck. We hunted long and hard, and although we saw numerous whitetails and even more blacktail deer, we just couldn’t find a whitetail buck to Wade’s liking — not too surprising since he has taken several already, his largest scoring a tick over 118 SCI points. The winds were strong, something we all believed had a lot to do with the deer staying hunkered down in the thick canyon bottom cover. However, late that afternoon Wade peeked down into a protected canyon and found Cody’s management blacktail. The young man has lots of hunting experience and cleanly took the fat forked horn with a single shot from 125 yards. Wade only had a half of a day to hunt Sunday, and when our whitetail honey hole only showed us young bucks, he switched gears to blacktail. At 0900 he had taped his tag to the antlers of a very nice 4x3 buck. That we were successful so quickly and efficiently is a testament to the skills of Thorp, a 28-year-old go-getter who also guides fishermen both in Oregon and Alaska. He had a plan based on his knowledge of the property and a solid week of everyday scouting. Wade and I had been trying to put this hunt together for several years, but one thing or another always seemed to put the kibosh on it. Wade is one of the most knowledgeable men I know when it comes to the ins and outs of big game hunting. Hunt costs are also quite reasonable, running $6,000 for the Columbian whitetail and $2,800 for blacktail. “This is one of the most affordable blacktail hunts I know of, and I book hunts for them throughout the deer’s range,” Derby said. “Success rates are almost 100 percent on good bucks, and the season extends far beyond the end of the whitetail season.” Both hunts run four full days. The Columbia whitetail deer might be small — the world record typical buck scores just 130 1/8 points, and there are only 18 typical bucks in the current SCI record book scoring over 100 points — but both they and the habitat in which they live are big in my eyes. And when the planets line up and a plan all comes together, success is all the sweeter. It was a dream come true for me.